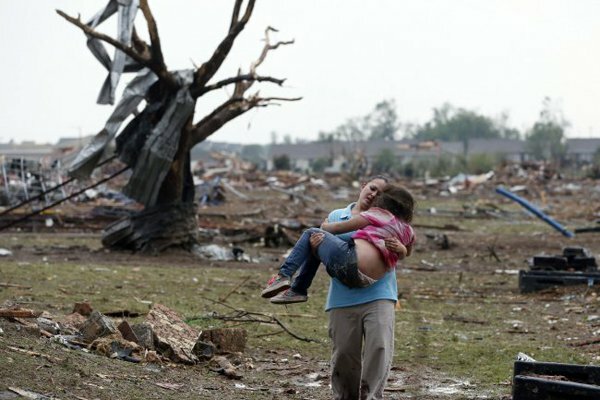 The tornado that struck the Oklahoma City suburb of Moore yesterday afternoon traveled 20 miles in 40 minutes, cutting a devastating path that left at least 91 people, including 20 children, dead. Neighborhoods have been flattened. Plaza Towers Elementary School was reduced to ruins. Search and rescue efforts will continue for days. : Click to give or text 90999 to make a $10 donation. : Click to make a donation, or text FOOD to 32333. $10 will be charged to your phone bill. : Click to donate online or call 1-800-725-2769.
: Donations will help with tree removal, laundry services, and meals for victims. : Their mission is to send military veterans to disaster sittations to help first responders. They are on their way to Moore. .
We'll continue to update this page with more resources.